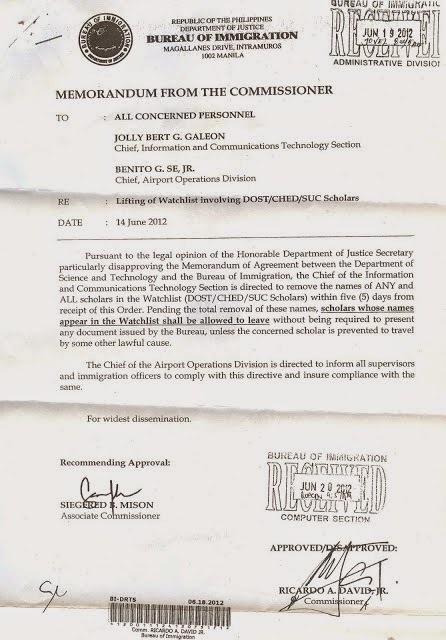 Pursuant to the legal opinion of the Honorable Department of Justice Secretary particularly disapproving the Memorandum of Agreement between the Department of Science and Technology and the Bureau of Immigration, the Chief of the Information and Communications Technology Section is directed to remove the names of ANY and ALL scholars in the Watchlist (DOST/CHED/SUC Scholars) within five (5) days from receipt of this Order. Pending the total removal of these names, scholars whose names appear in the Watchlist shall be allowed to leave without being required to present any cmm issued by the Bureau, unless the concerned scholar is prevented to travel by some other lawful case. The Chief of the Airport Operations Division is directed to inform all supervisors and immigration officers to comply with this directive and insure compliance with the same.”, as stated in the memorandum from BOI commissioner dated June 14, 2012. This is a good news..
Mga ka-iskolar, hindi pa po ako nkapag final clearance pero nkakuha ako ng NBI ko at passport noong 2010 ng wlang problema, pinalad n makaalis at nasa middle east ngaun. Ang kaso po nung magrerenew ako ng passport ko dito sa Jeddah PIC inabisuhan ako na nasa watchlist order pa din ako kaya pending po sa ngaun yung renewal ko. Humihingi ang PIC ng clearance ko eh wala akong maipakita. Hindi rin po ako makakuha kasi nandito ako sa ibang bansa. Mairerenew pa ba yung passport ko kahit my WLO pa din ako at walang clearance n maibigay? so ibig sabihin po nito, makakakuha na po ako ng nbi (for abroad) at passport kahit hindi pa cleared? hello good day this may sound like a music that keeps on repeating itself but i just want to prepare myself in any case. i was a scholar of DOST last 2009 and i enjoy the scholarship for 1 semester when my grade came out it shows that i got an INC, the next semester i was not able to avail the privilege of a scholar. i stopped for a year and find other ways to continue my studies, however i transfer and shifted to accounting technology course which of course not a priority subject of DOST. now the bottom line is, do i have to pay the DOST for the 1 semester and 12% interest and how much could it be? if i want my NBI clearance?